Scuba diving, snorkelling and shark cage diving are incredible experiences all on their own, but photographically capturing them is on an entirely different level. Underwater photography is nothing short of art, and it’s a means of freezing those magical underwater moments, as well as the beautiful marine life that delights divers at such deep blue depths. Taking images underwater comes with its challenges though, but once you invest in the necessary equipment, learn the right techniques and perfect the required skills, you will be able to capture some phenomenal photographs. Read on to find out all you need to know about becoming a professional underwater photographer. Before you can even try your hand at underwater photography, you need to make sure that your diving abilities are at a certain level. At the best of times, diving and swimming can be difficult, even more so while simultaneously trying to operate a camera. It can often be distracting and challenging, and the last thing you want to do is crash into a reef or get yourself into a sticky situation. Successful underwater photographers have perfect control over their buoyancy and are usually strong swimmers with adequate diving time under their belts. The bottom line is: you have to be a comfortable diver in order to take great underwater images. So you’ve decided where you’re going to be diving, and you’ve got your necessary equipment and accessories. Very often, you can get away with using a regular digital camera for underwater photography but this will mean you will need something called “underwater housing” (or casing). There are a range of different kinds of cases available to fit a range of cameras, made from either inexpensive plastic or the more expensive aluminium. Special silicone “o-rings” are used to create a waterproof seal around the casing. Water absorbs colours such as orange, red and yellow, so without using a flash, your photos will come out blue most of the time. The flash will add colour so it’s advisable that you set your camera to “forced flash mode”. Some photographers opt to use a strobe for extra light and to prevent ‘Backscatter’ (Flash highlighting the particles in the water). If you’re going to shoot while relying on natural light, you need to do so at 20ft or less, with the sun positioned behind you. Any deeper than that, and there won’t be adequate natural lighting, resulting in those pesky blue images. The key to taking the best pictures underwater is to shoot your watery subjects from low down, at eye level. Avoid taking snaps from above. The closer you can get, the better! Images shot very close to the subjects will more than likely have better colour, sharpness and contrast. Underwater photographers suggest underwater photography is taken using either a macro lens or a wide-angle lens. Macro lenses are used to capture the smaller creatures of the sea, whilst wide-angle lenses are used to produce images that include the actual water as part of the composition. Start off using a Wide Angle lens, as it’s generally easier to use, with macro images being a little trickier as you need to keep still whilst focusing on a very small object. Often images can come out showing what appears to be dust caught by the light used. This is called “backscatter” and it’s actually caused by the presence of plankton in the water that is often not visible to the naked eye. The way to avoid this is to position the strobe far away from the axis of the camera lens. In this way, it won’t be the water in front of the lens that is lit up, but rather the subject. Image Quality: For high quality images, you should go for a camera that has at least 16 megapixels or more, with a built-in flash as well as an optical and a digital zoom. Features: Your camera should be built to withstand a depth of at least 30ft and it should ideally be “crush proof”, which will enable it to resist the water pressure at great depths. Battery Life: Long-lasting battery life is key, as you will, most likely, be underwater for long periods of time. You should be able to take at least 200 shots on a single charge. Design: Cameras made from rubber or those with coarse surfaces will be the easiest to grip underwater. Since most underwater cameras don’t float, you want to be able to hold on to it with ease. Bali (Indonesia): Colourful reefs, schools of fish and spectacular wrecks. Hanifaru Bay (Maldives): Manta rays and whale sharks. Tofo (Mozambique): Manta rays and whale sharks. Marsa Shagra (Egypt): All the magic of the Red Sea. Bonaire (Central America): Stunning fish. Cozumel Island (Mexico): Turtles, eagle rays and giant sponges. Sipadan (Malaysia): Barracudas, jacks and turtles. 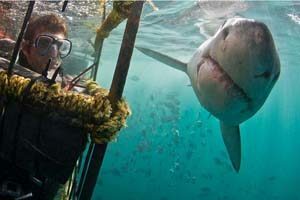 Gansbaai (South Africa): Great white sharks. Fiji: Soft coral capital of the world. Mastering the art of underwater photography is no easy task, but it is most definitely both thrilling and rewarding. Inevitably, a new-found respect and appreciation for the ocean and its marine life will be formed, and what better way to honour their beauty than by taking beautiful images that will last forever?